Courtesy of The Internet Archive. 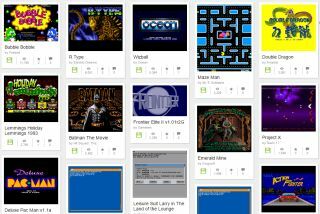 After having brought us almost 2,400 MS-DOS games last year, and more than 1,000 from the Windows 3.1 era back in February, The Internet Archive has expanded its collection once again, adding over 2,000 classic Amiga games to the convenience of our browsers. As with previous collections, compiler Jason Scott warns that while all of the games listed are free—a stonking list that includes the likes of Elite, Bubble Bobble, Double Dragon, Narco Police and R Type, to name but a few—there are some limitations, such as lack of save features and the chance that games will crash without warning. There’s also a fair amount of shareware files in there, such as intro and outro sequences, and a lot of proto-indie stuff I hadn’t heard of before. Nonetheless, so long as you’re willing to sift through that, there’s a mountain a classics to be uncovered/rediscovered—most of which seem to be in good working order (from what I’ve managed to try so far, at least). With a backlog list the length of my arm—not to mention the imminent arrival of No Man’s Sky—I can’t see myself venturing far from the house anytime soon. Wish me luck!